Recycle? We didn't do the 'green thing' back in our day! The woman apologized and explained, "We didn't have this 'green thing' back in my earlier days." The young clerk responded, "That's our problem today. Your generation did not care enough to save our environment for future generations." She was right -- our generation didn't have the 'green thing' in its day. Back then, we returned milk bottles, soda bottles and beer bottles to the store. The store sent them back to the plant to be washed and sterilized and refilled, so it could use the same bottles over and over. So, they really were recycled. But we didn't have the "green thing" back in our day. Grocery stores bagged our groceries in brown paper bags that we reused for numerous things, most memorable besides household garbage bags, was the use of brown paper bags as book covers for our school books. This was to ensure that public property (the books provided for our use by the school) was not defaced by our scribbling and doodles. 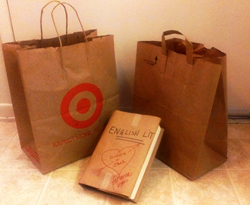 Then we were able to personalize our books on the brown paper bags. But too bad we didn't do the "green thing" back then.